Wisdom calls out when and where we need her the most. She calls us home to the city where she lives. These essays argue that Adam Smith, Edmund Burke, and Paul Johnson have heard wisdom’s call and that their political ideas can be better understood and appreciated when we see that they have been shaped and can be illuminated by the stories that make up our canon of wisdom literature. Let’s have a homecoming for the team that made self-government a reality in the first place. You can get Alan Griesinger’s book here. To some of you well-preserved readers, it might only seem like last year, but it wasn’t: Geoffrey Chaucer indeed died 415 years ago today! Ashes to ashes aside, that doesn’t mean you still can’t get to know him better. In fact, I think you have an obligation to do that. Why? Because of another in fact: The work of the Father of English poetry is dying from neglect. Hey pal: Properly understood, Chaucer is a must-read for those interested in the literary roots of modern conservatism. If that’s your bag (and it’s mine) then you need to read Alan Griesinger’s acclaimed A Comic Vision of Great Constancy: Stories Unlocking Wisdom of Everyman, which you can order here. Alan is a great friend of NR, and his terrific book exposes Chaucer’s timeless tales and their celebration of the rite by which characters are initiated into true government (which, as the ancients have known for thousands of years, begins in self-government), and looks at the real bond between Chaucer and the student he most influenced, The Bard of Avon. Hey, don’t take my word for why you should get your own copy of A Comic Vision of Great Constancy. That’s inspiring praise from cool people. Mark the day! Remember Chaucer! Learn! 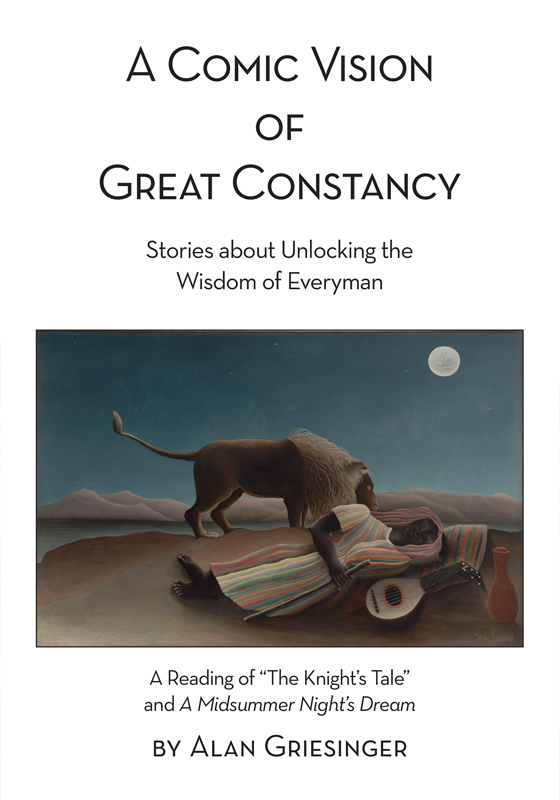 Get Alan Griesinger’s A Comic Vision of Great Constancy: Stories Unlocking Wisdom of Everyman, right here. In my post “A funny thing,” I briefly discussed comedy. I mentioned Ralph Stanley along the way. Coincidentally, Stanley died Thursday at the age of 89. (Juli Thanki is the author of the obituary published by the Tennessean.) I saw Stanley perform live twice thanks to the Coen brothers (and their musical director, T Bone Burnett), whom I also mention in that post. Alan Griesinger is a Power Line reader and student of comedy. He is the author of A Comic Vision of Great Constancy, available for purchase on Amazon here. 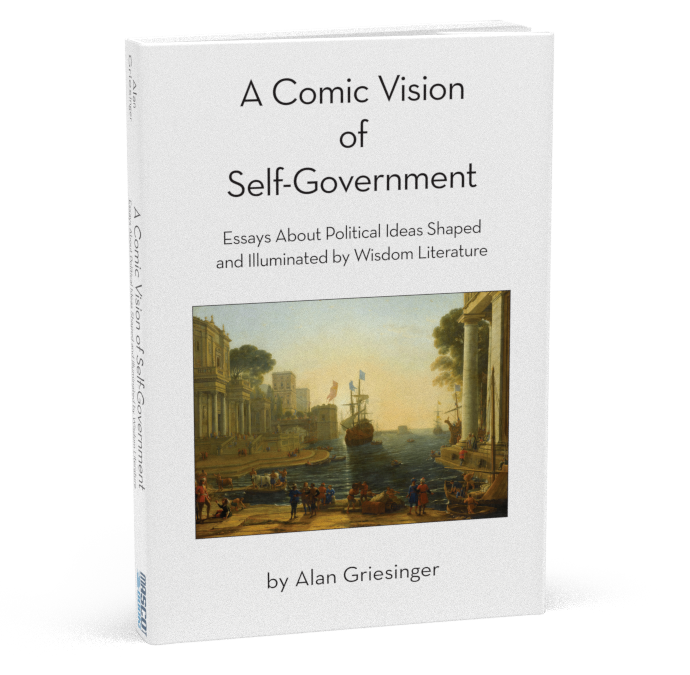 A Comic Vision of Self-Government: Essays About Political Ideas Shaped and Illuminated by Wisdom Literature, a companion, is forthcoming from Mascot Books. He writes to take issue with my take on comedy: When you write about comedy, you are going to get my attention. I have read “A Funny Thing” several times now to grasp what you are saying. It helped when tell your readers in the adjacent post that you would “achieve a comic perspective” despite the Great Depression of the 2016 Presidential campaigns. Clearly you are upset about the Trump Train Wreck. As a train wreck it’s a tragedy. Like Sullivan in his quest for a higher consciousness during hard times, you have been compelled by the train wreck to be concerned with the realm of conscience, order, justice, and civilization—the preoccupations of our higher selves. Like the adventures of Sullivan, however, the craziness of the experience has forced you to question the point, the reality, of this higher calling. The experience involves a kind of death, the end of our occupation and identity as writers about serous matters. Do you mean what you say about comedy in the opening of “A Funny Thing”? Your account of the musical A Funny Thing, the Coens’ movie, and the confession that you seek a comic perspective would seem to contradict the assertion that comedy is not moral and that it doesn’t serve a higher purpose. O Brother is one of my favorite movies. The scene where the boys find the lonely outpost in the middle of nowhere and sing “Man of Constant Sorrow” into that little tin can is, in my opinion, a great moment in American art. I keep going back to it as the heart of the film. It’s a comic moment and deeply serious at the same time. By means of the song and the tin can, we recognize ourselves in the man of constant sorrow, and the recognition registers as a vibrant harmony, like the harmonies in the chorus. Even though he’s confessing his sorrow, the timeless beauty of his song creates a magic space in the dry, pointless desert of my thoughts and fears. This is the power of true speech, and the true speech of comedy acknowledges the power of speech to deceive, to create pseudo worlds and great confusion. Comedy frames the experiences of these confusions and the power of truth which emerges from them into a form which celebrates the whole process as a part of life. It teaches us to laugh at missteps and misconceptions. Beauty and laughter are pleasures, but they aren’t just an escape from constant sorrow. They are real but otherworldly; we can’t control their coming and going. They are glimpses of Ithaca, of the home we seek, of the fellowship which allows us to survive and prosper. That’s why they are so important to our social order, and I have to assume it’s why the Greeks put comedies at the heart of their civic life. I’ve read that the writers who competed in the festivals of Dionysus had to compose four plays. The first three were tragedies, but the last had to be a comedy. According to this recipe tragedy occupies much of our time, but comedy has the last word. The two forms work together to celebrate the life force that Dionysus represents. This is how I understand the relationship of tragedy and comedy. © Alan Griesinger. All rights reserved.